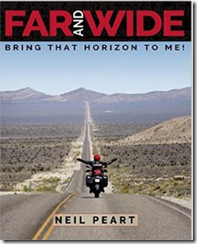 Neil Peart's latest book, Far and Wide: Bring That Horizon to Me! is scheduled to release on September 13, 2016. In recent months it became apparent that my experiences on the R40 tour in 2015 were much too vast and deep to fit into a couple of website stories. Plus I had far too many scenic and narrative photographs to fit in my usual format here. It would have to be a book. Yet I did not want to neglect this forum and its audience — just "go dark" on everybody for the year or so it might take to put together a book. A fun solution to that conundrum might be . . . this! During the tour I had been sending occasional images of the day’s travels to my circle of friends under the BubbaGram™ title, so I will continue that theme here. At semi-regular intervals I will post a photograph or two and an anecdote, to represent the work in progress. 35 concerts. 17,000 motorcycle miles. Three months. One lifetime. In May 2015, the veteran Canadian rock trio Rush embarked on their 40th anniversary tour, R40. For the band and their fans, R40 was a celebration and, perhaps, a farewell. But for Neil Peart, each tour is more than just a string of concerts, it’s an opportunity to explore backroads near and far on his BMW motorcycle. So if this was to be the last tour and the last great adventure, he decided it would have to be the best one, onstage and off. This third volume in Peart’s illustrated travel series shares all-new tales that transport the reader across North America and through memories of 50 years of playing drums. From the scenic grandeur of the American West to a peaceful lake in Quebec’s Laurentian Mountains to the mean streets of Midtown Los Angeles, each story is shared in an intimate narrative voice that has won the hearts of many readers.